Humble Pi | Damian Trasler's Secret Blog - Do Not Read! ← Community Theatre and costumes: Monster Vintage has a message! 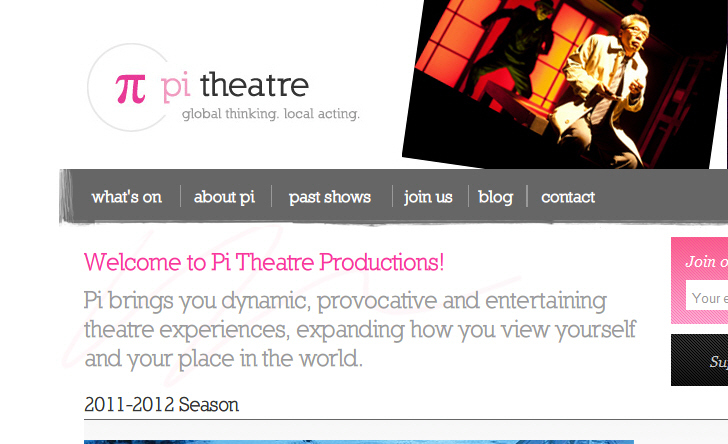 Pi Theatre's homepage. Go check them out, theatrelovers! There are days when you make silly mistakes, aren’t there? We’ve all done it, I’m sure. Well, the other day, I made a classic mistake. You’ll know from reading my letter to the Inland Revenue that I’m prone to sarcasm and verbal attacks when irritated, and when I was at a fairly low ebb (gloomy about the struggle to complete the latest play, if you must know…) I received an email from Pi Theatre. I didn’t read the email properly. I glanced at it and took in that a theatre company was asking me – a cash-strapped, under-performed playwright – to cough up cash so a bunch of actors could fanny about making up another incomprehensible mish-mash of a play that pleased no one but themselves when certain playwrights have a whole bunch of plays in their back-catalogue that are just WONDERFUL. See, hardly a balanced, sane response, was it? I’m utterly, utterly ashamed. If I had only gnashed my teeth in frustration and shouted at the computer, that would have been bad enough. But no. I wrote a sarcastic, cruel and rude rejoinder. Pi Theatre have a brilliant general manager called Becky Low. She would have been within her rights to cut me off from their lists, respond with a rude email of her own, badmouth me around the theatre community and make small dolls in my image to stick with pins. She didn’t. Instead Becky wrote a careful, calm and grown-up response that had me red-faced and cringing. She was exactly as courteous and professional as I hadn’t been. I wrote back with a much more considered apology, and thanked her for her time. She was kind enough to wish me all the best with my current projects and encourage me to stay in touch. So, if you’re considering taking in some theatre in the Vancouver area, may I recommend PI Theatre? They have a good roll of productions, and they work hard to encourage new local playwrights, like Sean Devine . And they’re forgiving and understanding of old, crochety ones. While we’re on the subject of Theatre, those lovely folks over at MonsterVintage are still interested in your input about using their stock of vintage clothing for costumes in Community Theatre productions. Obviously, being based in the US would be preferable, but they are wondering which plays out there would be best suited to their range of clothes. Take a look at their website and either contact them direct, or leave you suggestions in the comments below. Thanks! This entry was posted in Writing and tagged Damian Trasler, don't press send, monster vintage, PI Theatre, playwright, ranting, Sean Devine, theatre, vintage clothing, workshop. Bookmark the permalink. Oh, Damian. Not only did you come back with an apology but you posted your “human” moment, too. That takes courage. You have my complete sympathy cause *wince* I’ve done it, too. I still cringe over a couple of them. Oops. Told on myself. Lol.